How much does it cost to travel to Portland? How much money will you need in Portland? $136 is the average daily price for traveling in Portland. The average price of food for one day is $34. The average price of a hotel for a couple is $152. Additional pricing is in the table below. These average travel prices have been collected from other travelers to help you plan your own travel budget. How much money do I need for Portland? Referred to as "The City of Roses", Portland is the largest city in Oregon. It sits on the banks of the Columbia River and offers breathtaking views of Mount Hood when the weather allows. Portland is famous for its alternative vibe, live music scene, and popular microbreweries. It's also a mecca for environmentally conscious urban planning. The downtown area is quite compact and walkable. While the city itself may be smaller than you expect, it is still the largest metropolitan area between San Francisco and Seattle. For many people, Portland's atmosphere is a part of the appeal. The city has a youthful vibe with a lot of outdoor oriented activity. The population is known to be very eco-friendly and the city's atmosphere is actually quite relaxed. There are many independently owned shops that sell interesting and unique merchandise. You'll find plenty of used bookshops, coffee shops, and microbreweries, as well as a high concentration of restaurants for a city of its size. Portland has a similar climate to the rest of the Pacific Northwest. Rain is common during the fall, winter and spring seasons. It is not uncommon for there to be a constant drizzle or mist that keeps you damp, but downpours are less likely. Winters rarely see snow but can be very rainy. By late June, the clouds begin to part and the temperatures get much warmer. The summer months are very pleasant and offer a great time to visit the city. 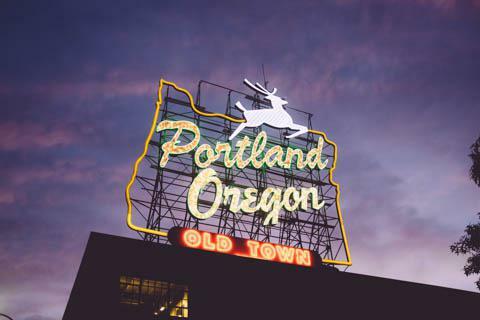 There are plenty of places to explore and wander in Portland, as well as some great sights and landmarks. The Museum of Contemporary Craft is a great place to visit as is the Oregon Museum of Science and Industry. The Portland Aerial Tram will give you some good views of the downtown area and, if the weather is good, the surrounding mountains. Portland Underground is a series of tunnels that can be explored by tour and Pittock Mansion is a beautiful Victorian mansion. There are some great gardens around Portland as well so make sure you take the time to swing by Crystal Springs Rhododendron Garden, the Grotto Gardens, or Forest Park. Northwest Portland has the neighborhoods of Chinatown, the Pearl District, Northwest 23rd and Nob Hill. Northeast Portland has Irvington, Alberta Arts District, and North Mississippi District. Finally, Southeast Portland has Hawthorne, Laurelhurst, Sellwood, Westmoreland and Eastmoreland. While you're in Portland, take advantage of the area's excellent music scene. There are a good number of venues that get some very popular shows, but it can be just as fun to visit the local bars and clubs and enjoying whatever local band is performing that night. There are also any number of festivals and events that take place throughout the year. The Portland Rose Festival is in early June and is the city's largest event. It's a fun and beautiful time to visit the city. Portland has no shortage of restaurants for all budgets. Burgers, cafes, Mexican, and Chinese restaurants are all great options for those on a budget. If you're looking for a nicer restaurant, there are plenty of seafood restaurants, wine bars, or grills that have great food in an excellent setting. It is best to avoid driving in downtown Portland. It can be expensive and difficult to find parking and the streets are prone to closing at random times. It's also a very pedestrian friendly city so this is one of the most convenient and fun ways to explore. Portland is also a great city for bikers. Public transit is also a good option. There are buses, streetcars, and a light rail system that all travel through the area. The light rail has four lines that are color coded. The Blue Line runs from Hillsboro east through Beaverton and downtown to Gresham. The Red Line runs from the airport to the downtown area and west to Beaverton. The Yellow Line runs from the Expo Center south to downtown and the Portland State University. The Green Lines runs from Clackamas Town Center north and west to downtown and the University.